A little humor for today. I hate using gas station bathrooms [who does?] They are creepy and nasty beyond all belief. 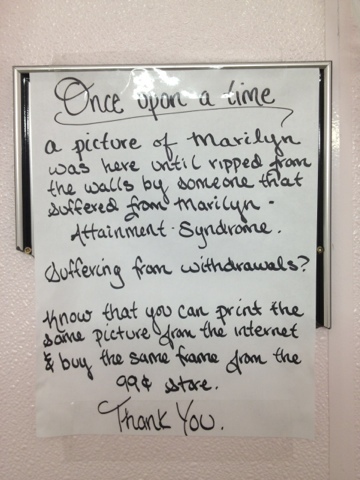 However, I walked into this gas station bathroom and to my surprise the owner had decorated it pink with cute lotions and pictures of Marilyn Monroe on the wall. Then I saw this half picture frame sign… so good. One of Bryan’s resolutions is to learn how to use my camera, so we practiced a bit this weekend. There’s this tree back home where Bryan and I both grew up. When we were dating [and even when we were “just friends”] we spent a lot of time reading in this tree. Bryan would sit on a limb and I would lay in the green grass as one of us would read to each other. Sometimes I would join Bryan in climbing, but I tend to be more of a ground squirrel who just dreams of being a tree squirrel. I’m partially cheating on this one. I talked to a lot of people that day, but this guy trumps them all. This may be because my love language is surprises, but I get overly giddy when I get little notes like this. And on days where I feel under the weather with a lot on my plate, love is coming in loud and clear. It feels like summer here in Davis!!! Eep! Bryan and I just finished a dinner picnic with friends and we are elated! Nothing gets us more excited than picnics, warm evenings, and wonderful friends. It just feels good for our souls. And listening to hilarious music from our childhood. I’m going to admit, this picture is a cheat. I took it at our one year anniversary in Portland, but it’s my favorite window picture. Brings back sweet memories. I love how you can see Mt. Hood in the background.